We warmly welcome you to our Hotel-Restaurant „Vater Rhein”. We would like to receive you in our purely designed guestrooms, which invite you to a stay in their pleasant atmosphere. Dear guests, in the period from 23.12.2016 to 11.01.2017 our restaurant is closed. Our hotel is closed between 23.12.2016 and 09.01.2017. 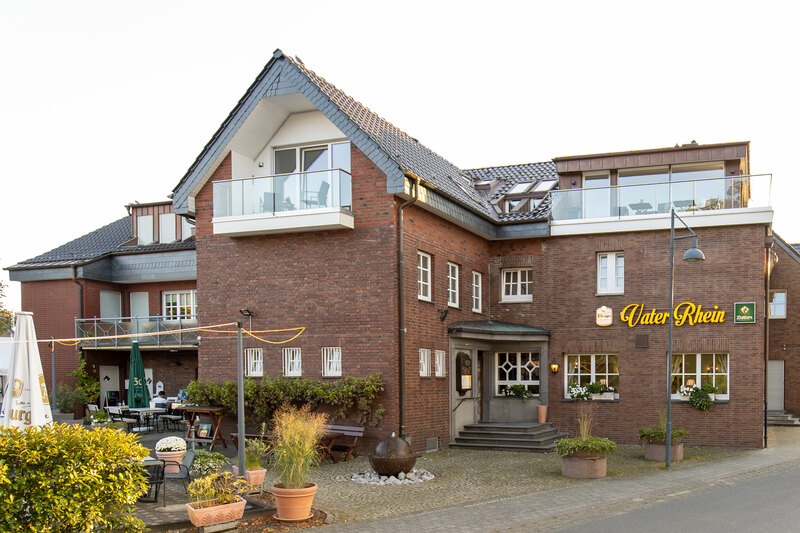 Spend some nights in our comfortable rooms - most of them overlooking the Rhine. Enjoy our popular international cooking. We invite you to discover the landscape protection area around the Hotel-Restaurant by walking, jogging or cycling along the Rhine. You can reach us easily after your visit of one the fairs in Cologne or Düsseldorf. After a day of work, you can relax in our beer garden. Or play ninepins in our skittle-alley. Celebrate with your family or colleagues in our nice banquet rooms. For free: high-speed Internet WLAN access available anywhere in the hotel.